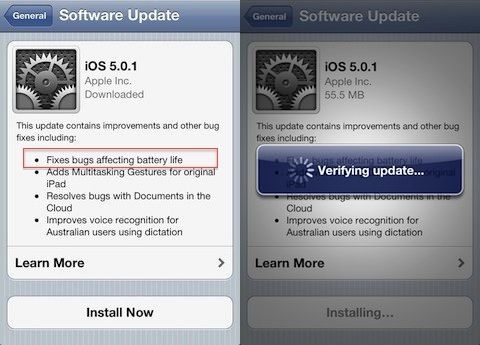 Tips for improving your iPhone 4S & iOS 5 battery life … battery-gate? The iPhone 4S sports a new rechargeable lithium-ion battery that has been upgraded from the previous iPhone 4 version. The 4S battery has been improved to a 1430mAh 3.7v unit although the new iPhone 4S runs on a faster dual core A5 CPU and a feature packed iOS 5 operating system, both of which consume more battery power. Hundreds of users are posting experiences of noticing a shorter battery life on their new iPhone 4S or older iPhones that have been upgraded to run iOS 5. We recommend you upgrade your iPhone 4S, iPhone 4, iPhone 3GS, iPad 2, iPod touch 4th gen right away. There is now even an option to install iOS straight from your iPhone without having to connect to a computer which is called Over-The-Air (OTA). If you don’t see the red badge message on your Settings app to upgrade, you can do it manually by going to Settings > General > Software Update. Our initial tests show that iOS 5.0.1 has in fact improved some of the battery drain issues. Please post your own findings in the comments section below. Full technical details about iOS 5.0.1 changes can be found on the Apple support website. Share your Experience: Have you experienced battery sucking issues as a result of upgrading to the new iOS 5 or iPhone 4S? Below we have compiled a comprehensive list of tips and best practices you can use to improve your iPhone’s battery life. The suggested specs for the iPhone 4S battery from Apple are listed below for your reference so you can compare them with your results. Monitor your usage – General > Usage > Time since last full charge. Keep an eye on these durations and you will be able to track exactly how long your iPhone battery is lasting over time. There appears to be a weird bug in iOS 5 where the location services for some apps get stuck which can be spotted from the GPS icon in the menu bar even after you’ve closed the app. You might even notice overheating with the iPhone 4S when this occurs. The best fix is to disable location services. If you don’t want to do that, since you’ll need it for Maps, be sure to at least enable the icon to appear in the menu bar as described below. This way at least you’ll know when there is an issue. 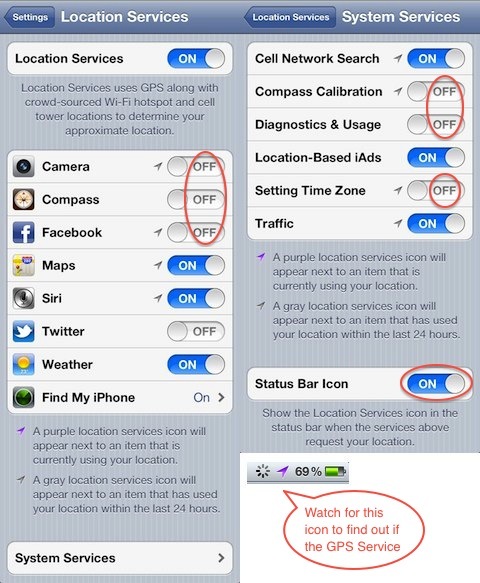 Location Services – Settings > Location Services > System Services > Off for any unneeded features. We reccommend turning off Compass Calibration, Diagnostics & Usage, and Setting Time Zone in this section. You can also turn off the other options in this page including Location-Based iAds, Traffic, and Cell Network Search if you wish. Location Based Reminders – If you’ve associated a location to a reminder, make sure you mark the task as complete in the Reminders app as soon possible to turn off its GPS feature. Disable, turn off or minimize all or some of the following settings and services if you don’t need them. Location Services mentioned above, iCloud, and Notifications are the biggest battery hogs. In a perfect world, with a bug free iOS, you should not have to disable anything. So, keep in mind that these tips are temporary, and you should not have to do any of these things once Apple has released or announced a fix for the iOS 5 battery issues. Use an Activity Monitoring iPhone app to track down trouble processes and apps. I don’t think it is problem of settings, i think it is a bug in iOS, or even worse – problem with iPhone 4s hardware! I also bought 4s with preinstalled ios5, I restored all the data from the iPhone 4. And it turns out that battery life in iPhone 4s (with installed SIM card) is 4-5 shorter that on iPhone 4 (without SIM)! After number of tests I found a battery problem in my iPhone 4, after upgrading to iOS 5. It was Setting Time Zone System Service, which uses a GPS continuously. You can see it in Settings>Location Services>System Services. In the same place you can switch on Status Bar Icon to see when and how iPhone using/used location service. On my phone this icon (an arrow in the right side of the Status Bar) was in a gray color ALL TIME until I switched off the Time Zone Service. After that I can’t see any battery problem and my iPhone battery works better than in iOS 4. I think this is a bug in iOS 5, but not a hardware problem. I use my iPhone 4s all the time and get over two days on a charge. I think not sending diagnostic reports and turning off Facebook push are huge. Also searching wireless networks has to be off and no Bluetooth helps a lot. But there is no “battery-gate” for sure, Apple just likes everything to be in the on position. Turn them off and you’re all good! I have noticed a considerable improvement since up grading to 5.01 – instead of the battery totally draining overnight I haven’t had to charge for more than two whole days and it is still at 48%, lunchtime day 3 – admittedly I haven’t used it much but it used to go down as quick on standby as in use and I’d be lucky to have enough battery left to ring home an eta at the end of a day in London after starting my journey on 100% battery. Hi Battery appsaffari.com ! Can you till me win somebody is Using my iPhone 4S apps Thanks ? I Am unable to deleted unwanted apps running in the background as I used to before I installed ios7 please could you advise me how to? I tried pressing them as we used to until they wriggled, but this doesn’t happen anymore. there isn’t good way to save the power,but if you install the bad app,then,the power will down very soon,iphone is the good mobile,but some app not so good,so plz leave far away the bad app!